OXFORD, Miss. 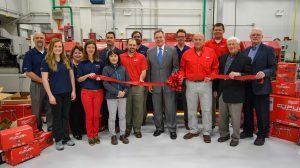 – The Haley Barbour Center for Manufacturing Excellence at the University of Mississippi received a generous gift Thursday (March 23) from Milwaukee Electric Tool Co.
Three representatives from one of the nation’s leading power tool manufacturers delivered more than a dozen toolboxes, power tools and accessories to the CME. University administrators and students welcomed the visitors and thanked them for the donations. “The CME team is honored and humbled by this most generous gift from Milwaukee Tool,” said Scott Kilpatrick, CME associate director of internal operations. “We are thankful to the company leadership for their commitment to supporting our students and this manufacturing program. A Brookfield, Wisconsin-based subsidiary of Techtronic Industries Co. Ltd., Milwaukee Tool is a manufacturer and marketer of professional, heavy-duty power tools and accessories. The company has three facilities in Mississippi: manufacturing operations in Greenwood and Jackson, and a distribution facility in Olive Branch. Jack Bilotta, director of the company’s Greenwood plant, was accompanied by Chris Greer, continuous improvement manager at Greenwood, and Dale Russell Sr., manager of human resources at Greenwood. Discussions leading to Thursday’s donation began last fall when company officials visited the center. “Some members of the Milwaukee Tool leadership team visited the campus and immediately recognized the value in partnering with the university,” said William Nicholas, director of economic development at UM’s Insight Park. The company’s engagement is not intended to be a one-year involvement, but to build a partnership that grows over the years, the representatives said. The donation of tools will be crucial in supporting various labs and course projects that are part of the center’s program, Kilpatrick said. Additionally, from a cultural viewpoint, the Milwaukee Tool brand will be present in the minds of Ole Miss students, Kilpatrick said. Administrators anticipate future collaborations with Milwaukee Tool, Kilpatrick said. “From the perspective of the CME, this is the type of partnership that can benefit all parties and clearly serves the mission of our center,” he said. “One of our primary goals is to support and serve manufacturers here in Mississippi, and an essential method that we use to accomplish that goal is to provide an educational and experiential program that prepares graduates to serve as leaders in the manufacturing industry. Several CME students present expressed their appreciation for the new tools and equipment. Vera Gardner, a senior mechanical engineering major from Memphis, Tennessee, agreed. Milwaukee Tools officials said they are certain UM graduates can and will find employment within the company’s Mississippi plants. The Haley Barbour Center for Manufacturing Excellence was established in June 2008 to provide unique opportunities for students interested in manufacturing. The opportunities developed are considered distinctive to the CME and are not available to undergraduate students at other universities in the United States. For more information about the CME, visit http://www.cme.ms/. For more information on the full line of Milwaukee power tools and accessories, call 1-800-SAWDUST or visit http://www.milwaukeetool.com.